It’s one of the most unusual standoffs ever between a mussel and a snake. Alicia Gray, her sister and niece and nephew were hiking along Sweetwater Creek at the same-named state park April 8 when they saw a northern watersnake with a freshwater mussel clamped onto its upper jaw. Gray didn’t realize how rare the interaction was until she researched it online and came up empty. First, the mussel appears to be a female southern rainbow, a species that uses soft tissue mimicking aquatic creatures to attract fish. When a fish tries to eat the “lure,” the mussel releases larvae that attach to the fish’s gills, which allows for growth and dispersal of the larvae (video). Southern rainbows typically have a crayfish-type lure. While northern watersnakes aren’t known to eat mussels, they do prey on crayfish and fish, Jensen said. 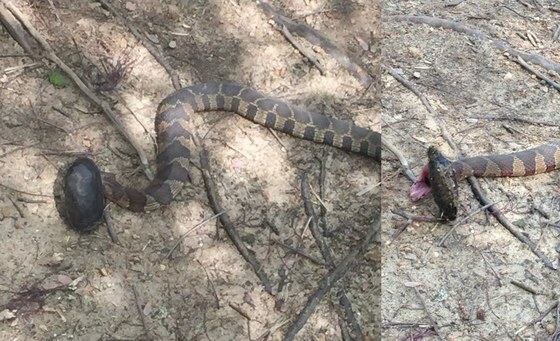 This snake may have struck at the lure or a fish attracted to it. When the snake’s jaw entered the mussel’s gape, or opening, the valves closed. None of this bodes well for snake or mussel. Mussels generally only gape about 6 to 8 millimeters to display a lure, Wisniewski said. Going wider tears muscles and results in death. That could help answer the question Gray’s nephew and niece had: Which creature would survive? But the answer also could be neither, Wisniewski suggested. “The ultimate winner … may be the first raccoon or otter that comes along, as both the snake and mussel are probably going to be defenseless." 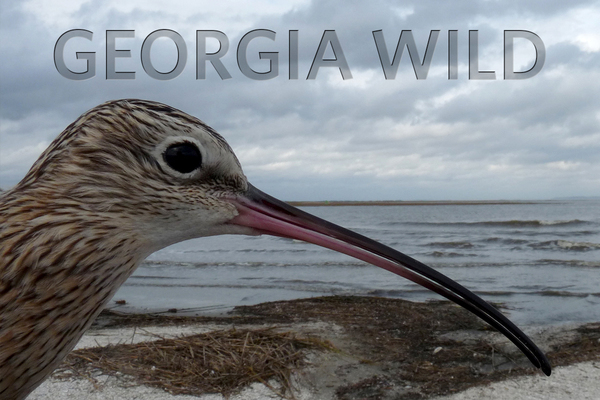 A long-billed curlew tracked from Georgia to – so far – Nebraska is providing insights into a population of these large shorebirds that has nearly been extirpated. The Smithsonian Conservation Biology Institute's Migratory Bird Center and partners including DNR’s Nongame Conservation Section outfitted the curlew with a satellite tag at Wolf Island National Wildlife Refuge in December. On April 5, the bird started west on migration. Eleven days later, it was in western Nebraska, having flown to Louisiana then angled north. The daily log, which the public can follow on a live-tracking map, will hopefully help researchers answer questions about the life cycle of curlews that winter on the Atlantic Coast. While the species also winters elsewhere – including California and Mexico – the breeding grounds and stopover habitats used by curlews visiting the southeastern coast are unknown. And the Atlantic Coast population has shrunk to fewer than 100 birds. Blog posts by the Smithsonian Migratory Connectivity Project refer to them as “the ghost bird” of eastern marshes and barrier islands. 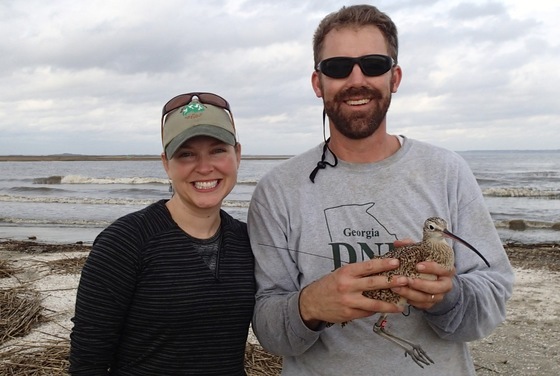 Wildlife biologist Tim Keyes, who leads DNR’s shorebird research, said researchers have “wondered about the few remaining Atlantic curlew for years, and we’re excited that Smithsonian invited us to help start solving this puzzle. Research partners also include the U.S. Fish and Wildlife Service, South Carolina Department of Natural Resources and Coastal Bend Bays & Estuaries Program. DNR’s Nongame Conservation Section depends largely on fundraisers to conserve the 95-plus-percent of wildlife not fished for or hunted in Georgia, plus rare plants and natural habitats. Help keep this vital work going by renewing or buying an eagle or hummingbird license plate. These sharp-looking tags cost only $25 more than a standard peach plate yet they accounted for 55 percent of revenue to the state’s Nongame Wildlife Conservation Fund in fiscal 2015, providing vital support for restoring and monitoring native species, from long-billed curlews to Georgia asters. Continent’s largest shorebird, with a wingspan of 24-35 inches. Breeds in grasslands of the Great Basin and Great Plains (U.S. and Canada); winters in California, Gulf Coast, Southeast and Mexico. Long, curving bill is well suited for nabbing shrimp and crabs deep in tidal mudflats, and earthworms in grasslands. Hunting undercut numbers in the 1800s, but habitat loss is the continuing threat. Populations are stable to growing in some areas but apparently declining in eastern parts of the breeding range, and disappearing along the Atlantic Coast. Coastal Plain bogs have been called small, rare jewels. They are one of the highest-priority habitats for rare plant conservation in Georgia, havens of unique plant lineups varying from carnivorous pitcherplants and butterworts to showy orchids and colorfully named species such as hatpin and colic-root. But although never widespread, Coastal Plain bogs have lost significant ground to agriculture, development, lack of fire and hydrologic disturbance – threats the surviving bogs still face. 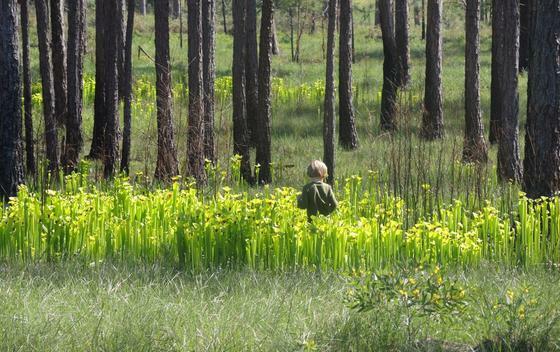 Which is why the Georgia Botanical Society turned its attention to bogs during last weekend’s 47th annual Spring Wildflower Pilgrimage, giving DNR a $5,000 check for bog conservation and taking field trips to area bogs. Learn more about the BotSoc’s contribution and Year of the Bog in this blog post. It’s no exaggeration to say Russ Singletary began his wildlife management career before most of his coworkers were born. For that half-century of dedication to conservation, including 10 years with DNR, the Southwest Georgia Sportsmen’s Club recently named Singletary its Habitat Manager of the Year for 2016. Regional Game Management staff of DNR’s Wildlife Resources Division nominated the Thomasville resident. Before man set foot on the moon, Singletary was working as the land manager at River Creek Plantation near Thomasville. He had attended Abraham Baldwin Agricultural College in Tifton and returned home to find a job just across the highway from his family farm. His employer and mentor was famed comic book publisher T.T. Scott. Singletary’s work ethic and conservation values were greatly influenced by Scott, especially concerning the role of fire in the longleaf woods. Scott did not believe in plowing fire breaks, and Singletary was expected to accomplish all the burning on the property using only grassy roads and creek drains as boundaries, which he did for many years with great success, in the process learning much about fire behavior and the ecology of longleaf pine forests. During that time, Singletary also handled livestock on the property, including dairy and beef cattle and a herd of Duroc hogs, and organized all other farming activities while conducting the wildlife management activities, including running all quail hunts. He remained the manager until Mr. Scott sold the property in 1989. Many years later, DNR was able to protect River Creek as River Creek, the Rolf & Alexandra Kauka Wildlife Management Area, and just in the nick of time, as the property was slated for development during the real estate boom of the early 2000s. Singletary was still living on his family farm across the highway. His decades of experience and knowledge of River Creek made him a valuable asset, and DNR’s Wildlife Resources Division hired him as a wildlife technician in 2005, shortly after the state acquired the property. Since, Singletary has been involved in all aspects of River Creek’s management, taking part in habitat restoration work and countless surveys and research projects for game and nongame wildlife. He helps the area manager plant all wildlife food plots and dove fields. His understanding of fire and ability to predict fire behavior make him invaluable in planning and conducting controlled burns. On rainy days, Singletary mans the wood-working shop, where he works on projects varying from making bat boxes and red-cockaded woodpecker cavity inserts to building kestrel and wood duck boxes. He plans every project in detail, resulting in a job done right the first time. It’s a practice Russ Singletary has followed for years, and the wildlife and habitats at River Creek are richer for it. Phil Spivey is a wildlife biologist in southwest Georgia with DNR’s Nongame Conservation Section. “This award brings well-deserved recognition to what has been a lifetime – not just 12 months – devoted to the management of deep southwestern Georgia’s wildlife and forests. 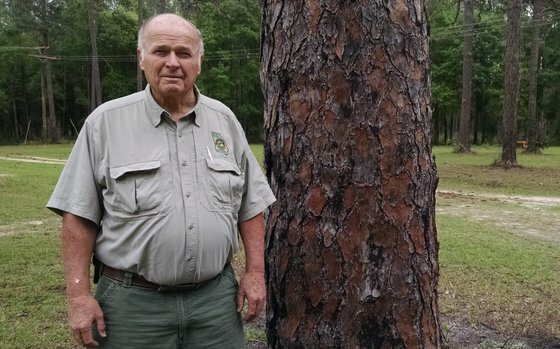 Russ found his first job in the pinewoods of the lower Flint River basin when he was a teenager, knew right away what he wanted to do with his life and now more than 50 years later he’s still there. That passion for and knowledge of one place is rare indeed, and when combined with Russ’ can-do spirit makes him an invaluable member of DNR’s Wildlife Resources Division." "I cannot think of anyone more deserving of this award. Russ is a wealth of information and a great asset to the agency. He’s also an inspiration to wildlife managers, as he truly cares for the resource that he has invested his life in." The two golden eagles fitted with transmitters in Georgia have left the state. 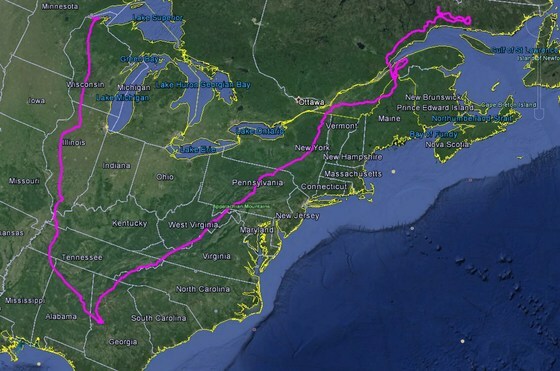 Tracked for a second year, the bird nicknamed Devil’s Backbone has returned to its summer haunts near the Gulf of St. Lawrence in Quebec, covering some 1,200 miles from Woodbury, Ga., along the Appalachians to the Canadian border from March 3-15. Flint, tracked since February ("Following Flint," Feb. 25), took a different tack, migrating into the Midwest, and now cruising forest along Lake Superior in northern Wisconsin. Project details. Like bats? DNR’s Nongame Conservation Section is looking for a few (more) good volunteers to drive twice-a-year routes in Georgia recording bat echolocation calls using an Anabat. Volunteers provide the time and a vehicle; DNR provides training and the recording device for the project, part of a nationwide survey of bat populations. Learn more and see available routes (run once in June and July). The U.S. effort to monitor for and hopefully prevent introduction of Bsal, an emerging pathogen threatening salamanders, is summarized in this National Wildlife Health Center bulletin. The U.S. Geological Survey agency says the nation has the “largest diversity of salamanders in the world” and Bsal could have “severe impacts on biodiversity and amphibian conservation” in North America. White fringeless orchid is back in the news after the U.S. Fish and Wildlife Service announced it has re-opened until June 13 the public comment period on classifying the plant as threatened under the Endangered Species Act. The agency said legal notices about listing what's also called monkeyface orchid, found in six southeastern states including Georgia, were not published in appropriate newspapers when the proposal was made in September. Work to remove encroaching trees and shrubs from a large bog on Fall Line Sandhills Wildlife Management Area in Taylor County are paying off. The area of open bog has increased more than five-fold in a few years and tawny cotton grass, possibly the state’s rarest plant, has gone from no known plants remaining in the wild to eight plants found in 2015. 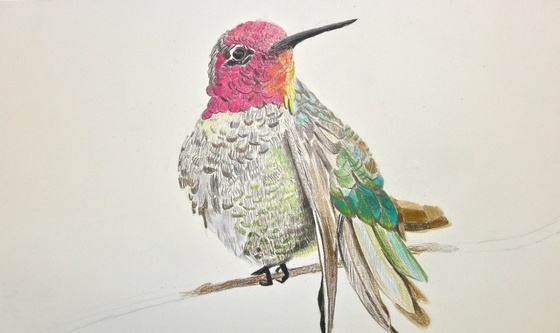 Division winners of the Youth Birding Competition T-shirt Art Contest are posted on DNR Wildlife Resources Division’s Flickr page. The grand prize winner will be announced at the Youth Birding Competition banquet and awards ceremony, which caps the birding portion of the event at Charlie Elliott Wildlife Center Saturday. A Johns Creek 16-year-old has won the 2016 Georgia Junior Duck Stamp Art Competition. Rayen Kang’s painting of a pair of hooded mergansers earned him a $175 scholarship from Georgia Power and the chance to compete in the national contest Friday. Snake sightings are rising as temperatures do the same, and more people enjoy the outdoors. DNR senior wildlife biologist John Jensen has some answers for those worried about what to do when they see a snake. Joe Burnam and Danny Smith of the Nongame Conservation Section recently planted 4,500 native warm season grass plugs to help restore groundcover at Chickasawhatchee Wildlife Management Area near Albany. The plugs were germinated from seed collected by Nongame Conservation staff following growing-season burns at Silver Lake WMA, near Bainbridge. Okefenokee National Wildlife Refuge staff will use Earth Day to launch a new app for visitors to the swamp April 23. Discover Okefenokee will include wildlife-spotting features and a scavenger-hunt trivia game, all geared to learning about the refuge’s wildlife, plants and habitats. "Rescuing" an animal can sometimes cause more harm than good, DNR cautions (video). Many animals that appear orphaned are not, and those that clearly are or have serious injuries should be cared for by a local, licensed wildlife rehabilitator. Names in the news: The Garden Club of Georgia has presented its Seal of Honor to Melissa Hayes, who handles administrative support at the Nongame Conservation Section in Forsyth office. Hayes was honored at an April 12 banquet for her dedication in helping Georgians manage wildlife habitat in their yards, neighborhoods and communities for Community Wildlife Project certification, an initiative of the club and the DNR agency. Judges in the 2016 Georgia Junior Duck Stamp Art Competition included DNR migratory bird biologist Greg Balkcom and Nongame Conservation Program Manager Bob Sargent. -- How tracking right whales went this winter. -- Why DNR’s falcon cam isn’t on air. -- The true value of eastern redbud trees. As prescribed fire season rolls on, DNR staff have worked controlled burns in high-priority sites across the state, such as Ohoopee Dunes Wildlife Management Area near Swainsboro and Laura Walker State Park southeast of Waycross. 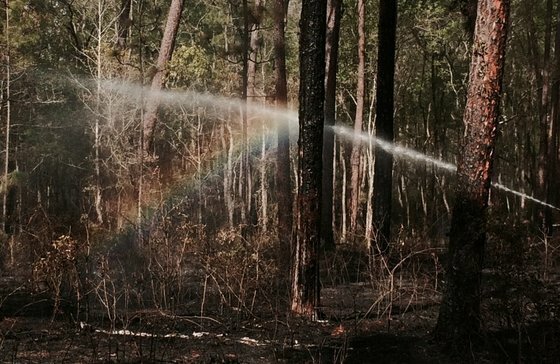 The rainbow above is from mop-up work following a prescribed fire in old-growth longleaf pines at Moody Forest Natural Area near Baxley.